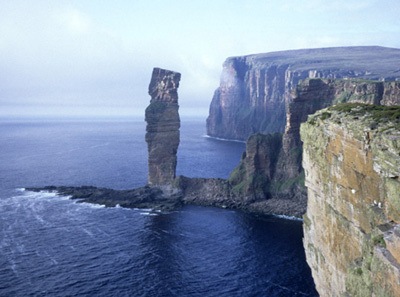 The Old Man of Hoy, Orkney: a 135-meter-high sandstone sea stack. A stack is a pillar of rock that forms an islet at the end of a headland. It is the result of a series of events caused by erosion. Sea caves striking a headland first carve a cave by opening up joints in the rock. The cave gradually penetrates the headland until an arch is formed. Finally, the top of the arch collapses and leaves a stack separated from the rest of the headland. The process may be repeated several times, giving a series of stacks.